Plastic Welding | Drader Manufacturing Industries, Ltd.
Repair plastic containers such as garbage bins, plastic totes, RV tanks, playground slides, and more with the hand-held Drader Injectiweld. “The Drader” as it is referred to by loyal customers, is a hand-held plastic welding kit and repair system known worldwide for its ease of use and strong welds. Our customers get longer life out of their plastics, reduce waste and achieve cost savings for their business. Sheet and pipe fabricators obtain welds from 1/16″ to 5/16″ in a single pass with the Drader. Some fabricators use the Injectiweld to securely spot weld products together, others use the welder to tack products together for ease in further processing. 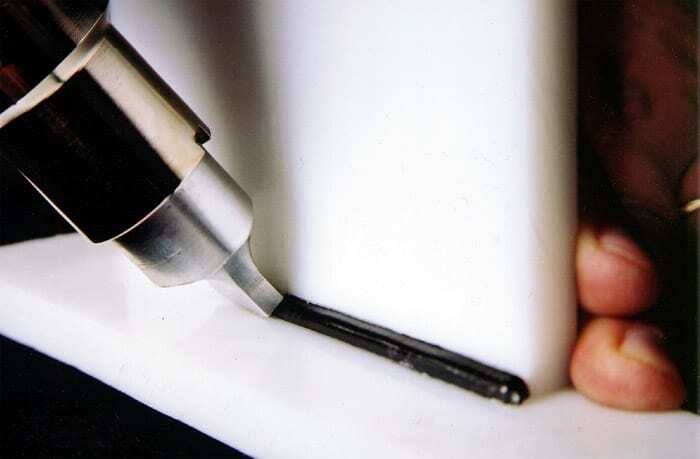 Bonding thermoplastics, such as high molecular weight polyethylene (HMWPE), polypropylene, polycarbonate (PC), polyamides, Santoprene, EPDM, ABS, polysterene and others is made easy with the Drader Injectiweld Plastic Welder. The Drader Injectiweld is great for repairing plastic containers such as garbage bins, plastic totes, RV tanks, playground slides, and more. Thin sheet welding applications are also ideal for the Injectiweld since it does not distort the plastic by blowing hot air.